We are pleased to provide you with a Media Measurement report with audience statistics on Top TV Stations and Top Radio Stations for Quarter 3 2016 in Rwanda, where the GeoPoll Media Measurement service is currently available . The above graph shows that Radio Rwanda has a consistent lead in ratings at the national level throughout the day. Radio 10 managed to achieve the second rating nationally between 10-12AM with an average of 2.81. Radio Rwanda has its highest ratings between 8-10PM with an average of 12.40. Radio Rwanda has the top spot, averaging 32.0% of all listeners followed by Kiss FM with an average share of 8.1%. Flash achieves the third share averaging 6.3% followed by Radio Salus with an average share of 5.8%. 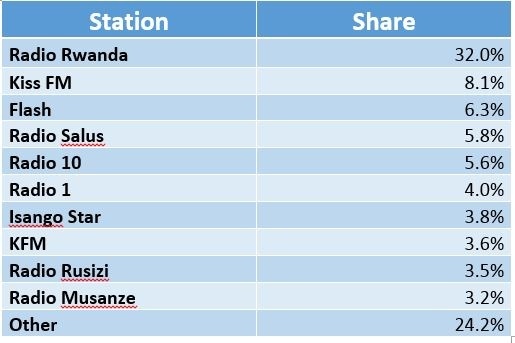 The share for other stations outside the top 10 which averages 24.2% indicates a large number of Radio stations in Rwanda, which broadcast across the country at regional level. 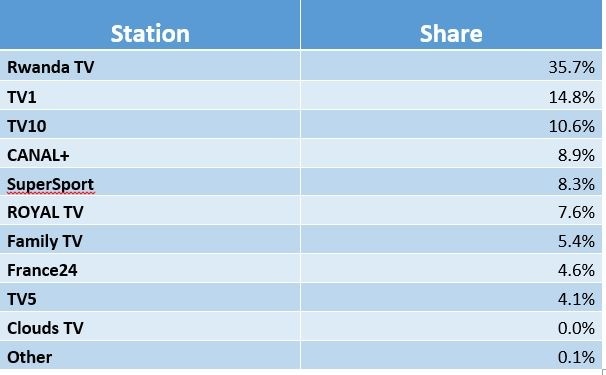 The below chart shows the average ratings for the top 10 stations during the peak hours, from 19:00 to 21:30. Rwanda TV leads in ratings consistently at the national level throughout the peak hours with its highest rating being at 8.30-9PM and 9.30-10PM. TV1 achieves the second ratings nationally followed by TV10. There is a stiff competition between the other stations during the peak hours. Rwanda TV achieves the highest share with an average of 35.7% followed with a great difference by TV1 with an average share of 14.8%. TV10 achieves the third share with an average of 10.6% followed by CANAL+ with an average of 8.9%.